As you can read on my about me page, I am sharing French recipes on a French girl “cuisine”. I also wrote that I will be sharing some recipes of our neighbors. French cuisine is French of course, but we could not have the French cuisine that we know today without the help of the surrounding countries. England, Belgium, Luxembourg, Germany, Switzerland, Italy and Spain are sharing their borders with France. With their borders, they share also part of their culture and food of course. For example, Flemish beef stew comes from Belgium but is also extensively served in the north of France. In Alsace, flamenkuch is a traditional dish shared with Germans. French cuisine took inspiration from English dish like pudding. We eat paella, bulls and tapas in the south. This is what makes French cuisine so special, a mix of culture with a common goal, eating good stuff. We eat from time to time some tapas in south of France and because our Italian and Spanish neighbors are big fans of Bruschetta, we are too! 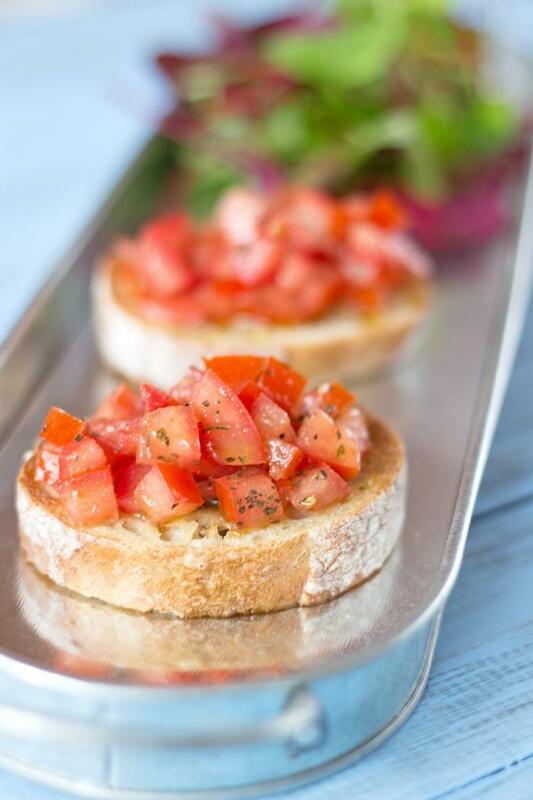 You can serve these little bruschetta during an apéritif associated with an aperol spritz or a summer red wine. You can also combine bruschetta with French verrines. This could be a tasty and pretty mix. You will find below a fast recipe. If you feel like it, you can change the type of bread you serve or make a mix. Wash and cut tomatoes removing flesh. Add tomatoes, basil, oil and pepper in a mixing bowl. Peel and rub garlic on toasted bread. Spread tomatoes on bread slices and serve. Thank you very much for reading. Register to the newsletter or follow a French girl “cuisine” to receive the latest recipes of a French girl “cuisine”.